Do you admire the majestic calmness of elephants? I do and I feel attracted to them whenever I see a photo or – even better – in the Zoo. What about if we could learn to be like them? Patient, calm, loving, funny too, faithful, and with open heart? 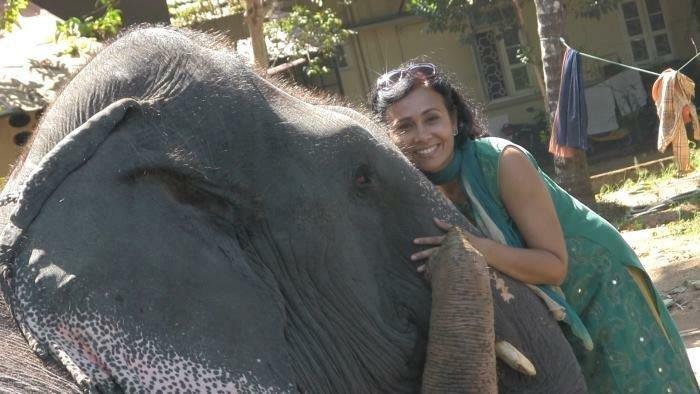 My friend +Sangita Iyer is super passionate about elephants. She has made a film about elephants this summer and she strives for freeing them from their often life long chains and heavy work and ill treatment. In our extra-show this week we will talk about her experience with Elephants and about the webinar she is offering on October 7th where she will talk about the elephant qualities and how you can awaken them in yourself. This is a very unusual approach to our wellbeing. I know from my own experience with animals how much we can learn from them. I have written several blog posts about this topic myself – and now I guess you are as curious to hear what Sangita can tell us as I am. Sangita is originally from India and now lives in Canada. She is the director and producer of the upcoming film “Gods in chains” and has just returned from India after filming. Her mission is to connect people with nature and wildlife for coping with stress and anxiety. Heidi Hornlein from ThePowerOfRelationship.com is a transformational coach, a relationship counselor and a voice therapist. She works with people who don’t feel yet fully realized in their life and helps them to explore their full potentials and to live a deeply fulfilling happy life in love and joy. Margherita Crystal Lotus from thecrystallotus.com, an intuitive Life/Business Mentor, who helps professional women overcome emotional overwhelm and stress, and restore their energy so they can have fulfilling relationships, and watch their career flourish.